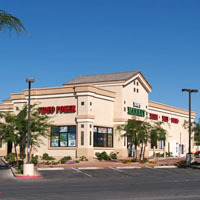 The Village at Centennial Hills will be an approximate 5-acre mixed use retail office “lifestyle center” at the northwest corner of Durango Drive and Deer Springs in the northwest part of the Las Vegas valley. The project is located across the street from new Centennial Hills Hospital in the master planned area of the City of Las Vegas known as Centennial Hills. Anchored by a Walgreens pharmacy (which Breslin Builders has provided the design and construction services for), the 45,895 square foot center will feature various in-line retail shops, a tavern use, a fast-food pad, and an office building. Breslin Builders is providing full services for the project including land-use coordination (completed), design and engineering services, and construction. Breslin Builders provided construction services for the “ultimate urban habitat” known as Metreon Lofts, a mixed-use development located on West Flamingo at the 215 Beltway in Las Vegas, Nevada. This project is a combination of various retail and office spaces in a multi-level environment. Once fully built-out, the project will also have two twin five-story residential components featuring condominium loft living units, including some live-work units. The modern design features various materials including exposed CMU block, stucco, and exposed metal skin and structural features to create a unique mixed-use blend. 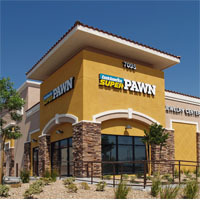 Breslin Builders provided design and construction services for the Cash America Super Pawn retail facility in the northwest part of the Las Vegas valley. Design to work with the Montecito master planned area of Town Center, Breslin Builders coordinated with Cash America to provide the detailed requirements of this two-story retail pawn shop. Coordinating merchandising, storage, security, and support spaces, this facility is top of the line. The building contains approximately 6,472 square feet of overall space. 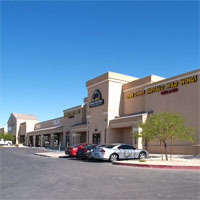 Breslin Builders provided both design and construction services for this 26,589 square foot retail center in North Las Vegas, Nevada. This in-line retail center also includes a tavern space for a Buffalo Wild Wings. 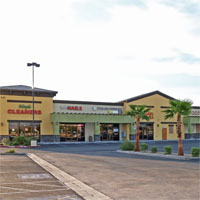 In addition to the retail area, the site contains a convenience store with gasoline pumps and a car wash, providing much needed services in this growing part of the Las Vegas valley. Working with a small corner parcel, Breslin Builders provided design and construction services to maximize the owner’s requirements and provide as much retail as possible. This was achieved with an in-line retail building that includes a Timbers Bar and Grill, as well as a corner pad drive-thru site for further development. Breslin Builders combined retail in-line spaces, an auto service center use, and a tavern use on this project to create this corner retail use. 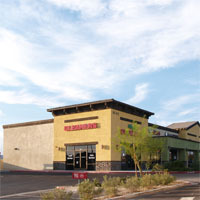 Anchored by a Timbers Bar and Grill, the balance of the site is designed to accommodate various retail uses to support this growing part of the Las Vegas valley. The center contains a 6,622 square foot tavern space and 12,285 square feet of retail lease space. Once again, Breslin Builders combined a free standing retail in-line space, an auto service center facility, and a tavern use on this project to create a mixed-use corner retail project. Anchored by what was a Quarters Bar and Grill (sister bar to Timbers Bar and Grill), the balance of the site is designed to maximize the retail and auto uses. Design and constructed by Breslin Builders, the center contains a 5,224 square foot tavern space, and 7,896 square feet of retail lease space, and 3,732 square feet of auto center space. Breslin Builders was the general contractor for the Adobe Plaza project which contains various uses over the development including in-line retail, a convenience store, a tavern use, and a golf driving range. Unique to this project is the construction method where Breslin Builders used Rastra Block building materials to not only provide the unique adobe architectural design features but also provided superior energy efficiency for the tenants. Also included in the site is the Salvation Army Retail Center and the Sierra Gold tavern (see our Casino/Hospitality/Restaurants page).